Today in Masonic History Fitz-Greene Halleck passes away in 1867. Fitz-Greene Halleck was an American poet. Halleck was born on July 8th, 1790 in Guilford, Connecticut. At the age of two, Halleck became partially deaf when two soldiers fired their guns close to him. At the age of fifteen he left school to work in the family store. In 1811, Halleck moved to New York City. He lived there for a few months before deciding to move Virgina when he realized that he was going to be unable to find a job. Just before he left town he was hired by Jacob Barker in New York City. He worked for Barker for twenty years. 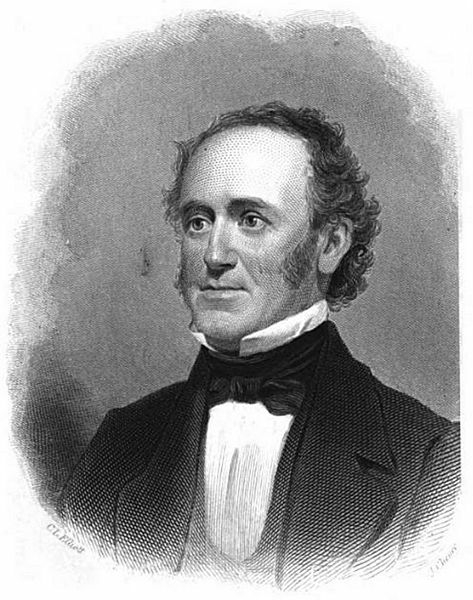 In New York, Halleck developed a friendship with Joseph Rodman Drake and the two wrote together. Famously they wrote the Croaker Papers in 1819. It was a satirical look at New York society of the time. It was extremely popular and the people involved with the New York society felt being satirized was the height of compliment. The two men also became members of the Knickerbocker Group made up of New York writers. The following year Drake passed away at a young age. Drake was married and had a daughter. His widow reportedly wanted Halleck to be her new husband. Halleck had often professed his distaste for the institution of marriage. It is also believed that Halleck was gay and was in love with Drake. For whatever the reason Halleck rejected Drake's widow referring to her in some of his writings as a witch. In contrast to these writings, Halleck had some level of affection for Drake's widow and her daughter. As one of his final requests when he passed away he asked that the Drake, his wife and daughter be exhumed and reburied with Halleck. After the passing of his friend, Halleck traveled Europe and wrote many poems. Back in the United States he was becoming famous and was at times referred to as the "American Byron." In 1832, Halleck was hired by philanthropist John Jacob Astor. Astor would make Halleck one of the trustees of the Astor library which would be the basis for Public Libraries. When Astor passed away he left Halleck with an annuity which Astor's son increased significantly. Later in life, Halleck went to live with this sister back in Guildford. He did not enjoy the fame that came with his writing. He often would become upset when people would inform him that they were naming a child after him. Where some might consider it an honor he considered it a burden. Halleck passed away on November 19th, 1867. His last words were to his sister Marie when he said "Marie, hand me my pantaloons, if you please." That was the last sound he made. Halleck was a member of Holland Lodge No. 8 in New York City, New York.